Marketing is a play of behaviors (ie., thoughts, words, actions, and deeds). Marketers influence behaviors to help achieve corporate objectives. Customers, particularly informed customers like doctors are not easily influenced by pharma marketers. This is because, doctors co-create (along with the core pharma marketers) the knowledge and use of pharmaceutical products. Hence, they are part of the marketing process ie., value delivery process. Doctors are different from laymen customers. In the latter, product knowledge ignorance is high. Doctors, on the other hand, are well informed of products and the diseases that the products help manage. Hence, such informed customers are natural participants in the marketing process that produce the consumption of pharmaceutical products. Thus, doctors are not only indirect customers of pharmaceutical companies, they are also in a way co-marketers or co-pharma marketers too. This represents the binary role of physicians in the medical and pharmaceutical firmament - they help in value delivery to patients - the actual consumers - hence the doctors are marketers. Yet they operate independently as professionals in diagnosis and treatment of patients. Hence, they are also target customers for pharma marketers. Physicians being at the interface between patients and pharma marketers, have a binary orientation - they participate as marketers in the value delivery process and at the same time from the patient's point of view, they are independent operators in the healthcare system offering diagnosis and treatment skills. Hence, physicians operate at a very high level on the trust factor with thier patients. They walk on a fine line and need to be highly ethical. If a patient finds out that his prescription is being doctored by the physician to help a pharma company achieve its corporate objective (in return for cash, or speaking engagements, conference seminars, gifts, samples etc) rather than being a treatment necessity, there is a big fall in the trust. This is evident in present day times where the media is all pervasive, fast, accessible, and often we see media activism at play. This is a double edged sword for pharma companies. When the end customer or consumer does not trust the doctor, it is inevitable the patient does not trust the pharma companies too. It is in this regard, that producing desired behavioral outcomes in terms of patient compliance, and prescribing behavior becomes very challenging. The very basis of business and health service is trust. I met an orthopedic patient while traveling aboard a plane recently. He seemed to have become a 'semi-doctor'. Truly I was conversing with an informed patient. This gentleman had in-depth knowledge and had keenly analyzed the various treatment options exercised by his doctors. I was just wondering how tough it would be in years to come for pharma marketers to market their produce in the face of such informed patients. The advent of the informed patient is sure to change the dynamics of pharma product consumption. It is inevitable that pharma companies start working on a mandate of TRUST BASED MARKETING. To pharma marketers, this means creating an image of being a reliable entity from the point of view of doctors and PATIENTS. When a patient buys a tablet of a calcium supplement on recommendation of a doctor to manage his osteoporosis, the patient should not feel conned or feel he is a victim of a trade - the smiling fast talking academic minded doctor who has a very large influence over his patients and the pharma company who has the doctor in a 'vice-like bear-grip' through a motley of services ranging from speaker assignments, special payments for being an opinion builder doctor, gifts, trips abroad, and other services. This basically means a crime committed on a patient by the doctor - the crime being prescribing to satisfy the needs of a pharma company rather than the patient's health need. Who should sit down and define a WHITE APRON (or White Coat) CRIME? Well, eminent medico legal jurists, pharmaceutical experts and the doctors themselves should create a ethical and legal framework for doctors and pharma marketers to operate by. This will help both the doctors (who are semi-pharma marketers as they are involved in the value delivery process of pharma marketing) and the core pharma marketers retain trust of patients and society at large. This charter can be called as TRUST BASED PHARMA MARKETING LEGAL CODE FOR DOCTORS AND PHARMA MARKETERS. This legal code can define a WHITE APRON CRIME (committed by doctors - since doctors are semi-pharma marketers), penalties for committing the white apron crime, and the legal and ethical marketing services that can be transparently provided by the core pharmaceutical marketers to doctors who are semi pharma marketers. The code should also lay down the patient rights. It should also ensure that the doctor puts out on his prescription any competing interest - eg. 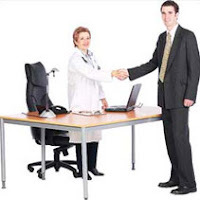 the doctor should declare that he or she has received regular samples of the prescribed product, he has received a good gift for prescribing a certain quantity of the same, and as an opinion builder speaker doctor he should also declare the speaker fees he or she has received from the core pharma marketer. The initial annoyance will be very high - dissonance will be extremely high with such an initiative. The doctors will spew venom because it will touch their ego, and will downgrade their status as sacrosanct persons of the healthcare profession. However, in the larger interests of the medical and healthcare profession this is very important surgical necessity. If such strong measures to discipline pharma marketing and prescribing (mal)practices, through defining a WHITE APRON CRIME (or White Coat Crime), are not done (as doctors are actually semi-pharma marketers), the overall image of the medical and pharmaceutical profession will continue to take a beating. PS: IF YOU CAN WHITE COLLAR CRIMES IN SOCIETY WHY CAN'T YOU HAVE WHITE APRON CRIMES? Thanks for reading this blogpost, please scroll down to read all other blogposts, click on 'older posts' wherever necessary, please inform your acquaintances of this blog.